The blue spots in the second map are the 7 main stars and the nebula. I used a linear perspectivic transformation to fit it. Pretty good matching, I guess. As I have been told now, this matching of the Orion-belt on the Tharsis-volcanos was first published by Walter Hein in his book Wir, vom Mars, Köln 1979, S.89-91. 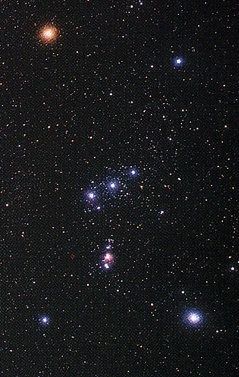 Alnilam is the central belt star of Orion, if you reverse the letters you get Malinla, which means Malin JPL NASA.